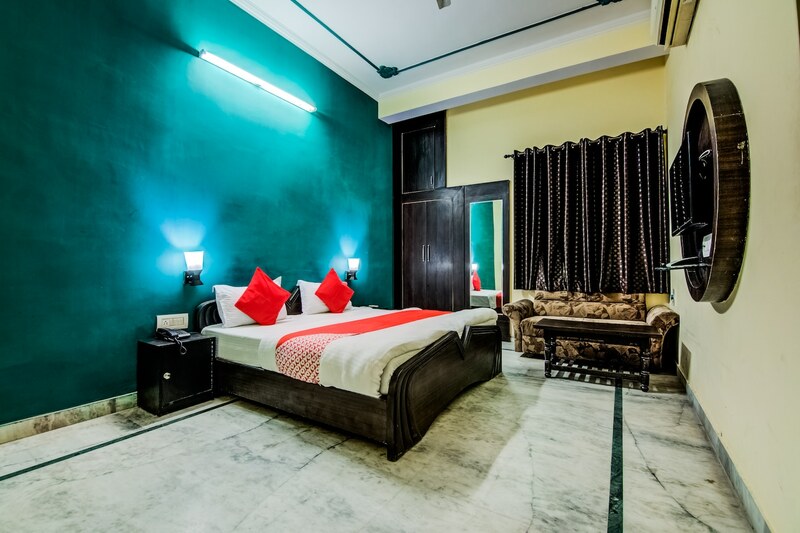 Enjoy a cozy stay at Hotel Malhotra with its vibrant accommodation and top quality amenities. The hotel is pocket-friendly, suitable for various travelers. The ambience of the hotel is dynamic with chandeliers adorning the place and artwork put up in every corner. The uniquely designed room is bright with beautiful lighting and wall finishing. The statement wall done in vibrant shades is appealing and impressive. The rooms are simple, spacious, and elegant with basic modern amenities provided for a pleasant stay. Facilities at the hotel include free wifi access, CCTV cameras, laundry and power backup. Sun Temple Of Jaipur, Khate Shyamji, and Rang Bihari Jee Ka Mandir are top tourist spots near the hotel and offer you plenty to do during the day.